With 40 acres of land at their disposal, and not a neighbor in sight, the owners of this property could have built any new home they liked. But rather than creating a sprawling estate, they chose a vertical design that would have worked just as well on a much smaller site. 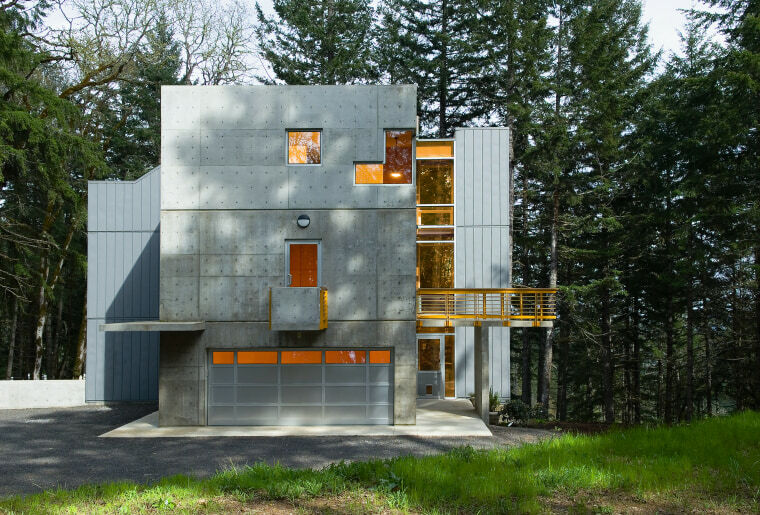 Having seen the work of David Lawrence Gray Architects before, the owners had their hearts set on a tower house design with plenty of exposed concrete something the practice is known for. "Aside from it being a tower, the second major part of the brief was that the house needed to be partly made of glass, so that when all the lights are on at night it would become a beacon of light," says Gray. This allows the owner, who is a helicopter pilot, to locate the house from the air. The 2500sq ft form is composed of five towers, constructed from three main materials. One is made of glass, one of concrete blocks and one of poured concrete. The stairwell and elevator shaft are clad in zinc. There is a deliberate lack of landscaping around the house the idea being to let the natural flora grow up around the sculptural form, thus blending it into the forest. To give visual relief to the flat fae§ades, Gray has incorporated some projected elements. Balconies protrude on two sides, and a concrete lip provides a sheltered path to the front door. The use of different construction materials led to the windows taking a variety of shapes in each tower. The concrete block tower is broken up by rectangular and slit windows, combined with small windows cut out of the corner. The joinery used on the glass tower divides the form into functional, opening windows while the changing grid pattern also gives each section visual interest. The structure is divided into two areas with different functions a home office and garage occupies the ground floor, with the owners' residence above. The home office takes up the lowest part of the glass tower. It is a double-height space, set into the slope of the land. The main entrance to the house is at first floor level. 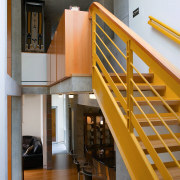 From the entry, an open railing offers a view down into the office. Above the office is another double-height glazed space. 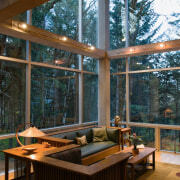 This is the formal sitting room, which has an immediate view of the fir trees. 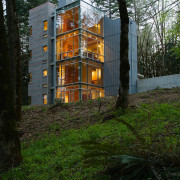 Gray describes this room as being like a tree house. It connects to the open-plan kitchen and family room. A unit of cabinetry, built around a structural column, divides the more formal sitting room from the family room, where the owners watch television. A double-sided gas fireplace warms both spaces. "The sitting room is an interesting, three-dimensional space. 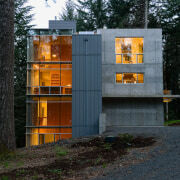 Architecturally speaking, I felt it was important to have something of this volume in an otherwise compact floor plan." The two balconies open off the kitchen and dining area. The larger of the two has an unusual asymmetrical shape, and is big enough for a table and chairs, while the other is just large enough to step out onto. It overlooks the garage, meaning the owners can step out from the kitchen to see who is coming up the driveway. The interiors show Gray's predilection for exposing a building's structural materials, such as the concrete and blocks. 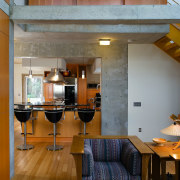 In almost every room, the ceilings are exposed concrete, as are the structural beams and columns. 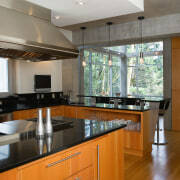 "The wood floors and cabinetry warm up the concrete. 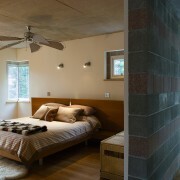 We would expose more concrete in the interiors if we could, but that would lead to too much heat loss. 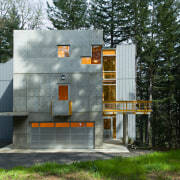 You have to insulate with wood in some places," says Gray. The second floor holds the master bedroom and an open-plan bathroom and dressing room. Again, an open railing at the top of the stairs provides a view down into the double-height living room. The dressing room is quite large and has a picture window, letting in plenty of natural light. There is extensive hanging space and storage along two sides of the room. 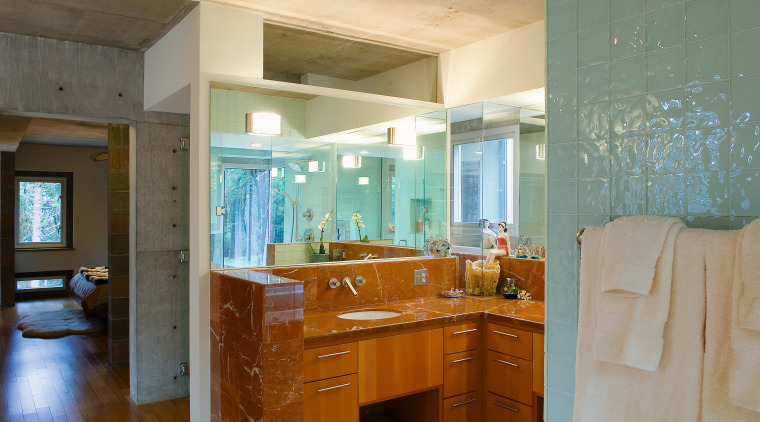 The bathroom features two vanities and a shower stall and tub enclosed in glass. 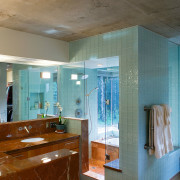 The tub is set below a corner window and is accessed by stepping through the shower stall. 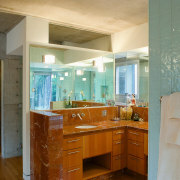 The shower and bath enclosure is finished with pale blue glass tiles, contrasting the rich terra cotta-colored marble used on the vanities. The master bedroom is part of the concrete block tower, and this material is exposed along the corridor leading to the elevator. The small windows give glimpses of the trees, but the room feels suitably darker and cozier than other parts of the house. 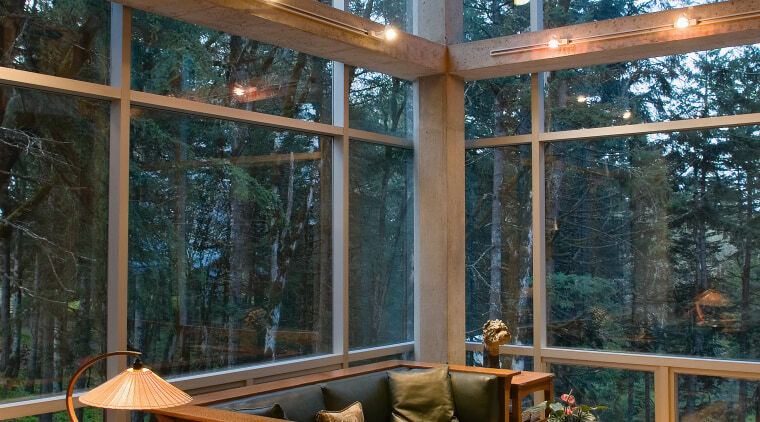 "This house is incredibly light, considering the greyness of the Northwest. It's also an unusual style of architecture for that part of the country, and is a tribute to the way the owners wanted to live their lives," says Gray.